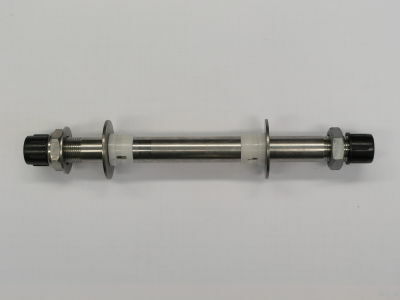 The MCM Solid Stainless Steel Tilt Rod Assembly is to replace the factory tilt tube. With surf rescue, the motor should be able to hold up in any tilt position. However, the factory tilt tube is assembled with 2 x nylon bushes which make it very difficult to assist with making the motor hold up. An unsafe condition exists, when IRB operators tighten the tilt tension nut so firmly in an attempt to acquire the motor to stay in any tilt position, and the end result is a twisted off thread section, or stripped lock nut and thread, rendering the motor unusable. This condition can be easily rectified by cutting off the vertical washer part of the bush and replacing with stainless steel washers. 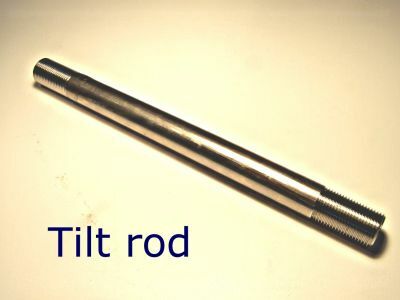 This allows a greater friction to be achieved which will then allow the motor to be held up in any tilt position after the tilt tube lock nuts are firmly tensioned. Material: 316 solid stainless steel tilt rod,2 x 50 mm x 23 mm stainless steel flat washers,1 x 42 mm x 23 mm stainless steel flat washer.